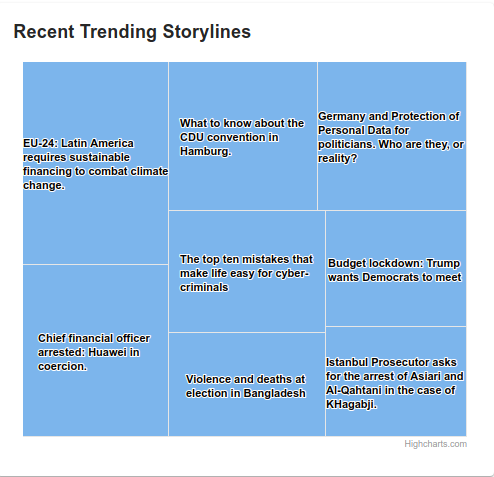 In the scope of SUMMA project, Deutsche Welle developed a data journalism dashboard. 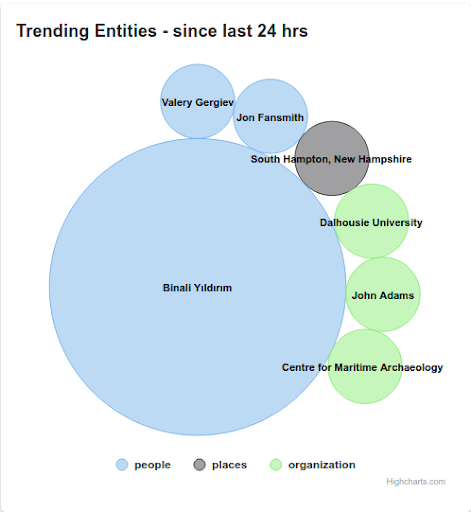 The dashboard has two components; trending entities for the last 24 hours and trending storylines since last month. The output from the SUMMA system is consumed by the dashboard through SUMMA APIs. Entities are people, places and organizations detected in the Deutsche Welle content from seven languages – English, Farsi, Arabic, Ukrainian, Russian, German and Spanish. For the widget, we select entities detected since the last 24 hours. The size of the bubble represents mentions of the corresponding entity in the news feed. The color represents the type of entity. The storyline component produces trending storylines. Storylines are clusters of media items both, audio and video, of similar content. For the visualization we select storylines that were detected during the last month, have more than 20 media items and the last media item was added to the storyline in less than 24 hours ago. We then show the results in form of a tile view. The size of the tile corresponds to how many media items were attached to the storyline.